Bangladesh A settled the three-match unofficial Twenty20 series victory 2-1 against host Ireland A after having a six-wicket win in the third game at Malahide Cricket Club Ground in Dublin on Friday. Bangladesh A shored the win in the rain-hit series decider, scoring 187 for 4 in 16.5 overs in a curtailed 18-over-a-side affair, in reply to Ireland A’s post of 183 for 5 in 18 overs after opting to bat first. Al-Amin hit a boundary in the match’s last ball off Joshua Little to draw the winning line while opener Mohammad Mithun hit a half century and depicted a solid opening wicket partnership of 117 off 10.1 overs with skipper Soumya Sarkar to prompt Bangladesh A’s chase. With ball, pacer Mohammad Saifuddin was most successful having four Irish wickets for 24 off four overs. Mithun’s quick-firing 39-ball 80 witnessed seven boundaries and six over boundaries before being removed on 139/3 in 12.3 overs as he was caught behind by Stuart Thompson off Shane Getkate, who was the most successful wicket taker for Ireland A with three-for 36 runs. Soumya’s innings of 30 balls saw a three-run deficit for another fifty in the series as he was dismissed from opening stand hammering two boundaries and four sixes before being caught by William Porterfield off Shane Getkate. Soumya hit 41-ball 57 in the first match a four-wicket win. Al-Amin [21* off 13b; 2×4; 1×6] and Mominul Haque [11* off 6b; 2×4] shared unbeaten 13-ball 25 to reach the end, starting after the dismissal of Zakir Hasan [13 off 9b; 1×4; 1×6] on 162/4 in 14.4 overs. In the Ireland A innings, William Porterfield [78 off 39b; 12×4; 2×6] and unbeaten Simi Singh [67* off 41b; 7×4; 2×6] were the big hitters with their fifties and both shared 111 off 10 overs in the fourth wicket, starting after Bangladesh’s haul of 44/3 in 4.5 overs. Opener Stuart Thompson played for three boundaries off 9-ball 12 to be another double digit scorer for the losing side. Bangladesh’s left-handed pacer Shoriful Islam (1/41) and Irish left-handed pacer Joshua Little (1/50) were two other wicket grabbers in the series decider. Bangladesh A started their unofficial Twenty20 series campaign with a four-wicket win in the first game while Ireland A got a comeback 51-run victory (DLS method) in the second match to make the third and last match as decider. However, the second match was rescheduled for a one day with shifting of match venue to the Malahide Cricket Club Ground from the Castle Avenue Cricket Club Ground with both parties consent as the originally scheduled day’s encounter had to be called off due to rain on August 15. In the second match, Ireland A scored 202/6 in 20 overs while Bangladesh a scored 104/7 in 15 overs before the rain hit the match. 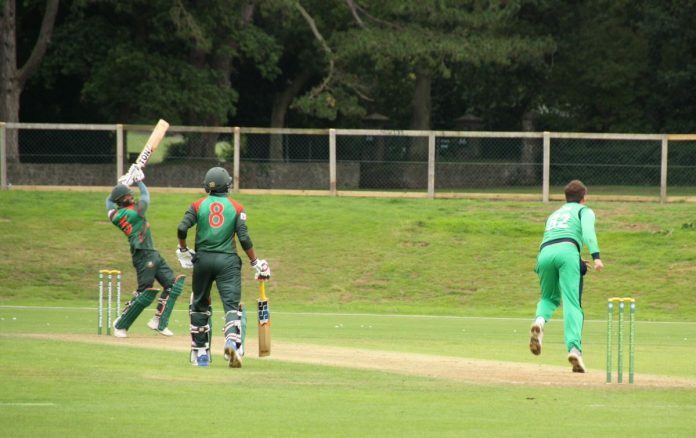 In the first game, Bangladesh reached the winning total of 155/6 in 18 overs, in reply to a total of 152/10 in 20 overs, posted by Ireland A after opting to bat first at Clontarf Cricket Club Ground on August 13. The rain also forced to see a no-result affair on the tour opening unofficial ODI, leading the five-match series to a 2-2 draw. In the evenly-contested unofficial ODIs, Mominul Haque-led Bangladesh A took a 1-0 lead with an 87-run win in the second match while Ireland A leveled the margin 1-1 with a 34-run win in the third game. Bangladesh A took the lead again 2-1 with a 85-run victory in the fourth match before Ireland got an eight-wicket win for a series of 2-2 draw. Bangladesh A innings: 283/8 in 50 overs; Fazle Mahmud 74, Mohammad Mithun 73, Mominul Haque 46, Peter Chase 5/42, Simi Singh 1/31, Jonathan Garth 1/54. Ireland A innings; 285/2 in 46.4 overs; Andrew Balbirnie 160*, Andy McBrine 89, Simi Singh 20*, Shariful Islam 1/45, Sunzamul Islam 1/56. Bangladesh A innings: 386/4 in 50 overs; Mominul Haque 182, Mohammad Mithun 87*, Zakir Hasan 79, Andy McBrine 1/51, Peter Chase 1/84, David Delany 1/75. Ireland A innings: 301/10 in 46.1 overs; Andrew Balbirnie 106, Simi Singh 53, James McCollum 43, Stuart Thompson 42, Fazle Mahmud 3/47, Khaled Ahmed 3/73, Mohammad Saifuddin 2/35, Shariful Islam 3/53. Ireland A innings: 245/10 in 49.3 overs; Stuart Thompson 69, Andy McBrine 58, Khaled Ahmed 4/42, Sunzamul Islam 2/41, Mohammad Saifuddin 1/56. Bangladesh A innings: 211/10 in 46.3 overs; Mominul Haque 46, Saif Hassan 34, Mohammad Saifuddin 27, Sunzamul Islam 26, Al-Amin 22, Mohammad Mithun 23, Tyrone Kane 4/24, Andy McBrine 3/37, Barry McCarthy 3/37. Bangladesh A innings: 289/6 in 50 overs; Zakir Hasan 92, Fazle Mahmud 53, Al-Amin 47, Peter Chase 3/63, Tyrone Kane 3/67. Ireland A innings: 202/10 in 46.3 overs; Tyrone Kane 49, Shane Getkate 38, Shariful Islam 3/40, Khaled Ahmed 2/27, Mohammad Saifuddin 2/34, Sunzamul Islam 2/35. 1st ODI: The match was called off due to rain where Ireland A were sent in to bat first to score 37/1 in 5 overs before the rain at the Oak Hill Cricket Club, Wicklow on August 1.